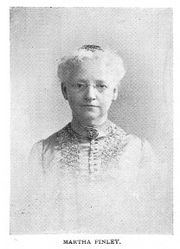 Martha Finley [aka Martha Farquharson] (1828-1909) Buffalo Electrotype and Engraving Co., Buffalo, N.Y.
Martha Finley was the daughter of Presbyterian minister Dr. James Brown Finley and his wife and cousin Maria Theresa Brown Finley. Martha was raised in Ohio and became a teacher before publishing her work under the pen name "Martha Farquharson." Although she was a prolific writer, she is best remembered as the author of the popular children’s novel, Elsie Dinsmore (1867) and the subsequent Elsie series, which consisted of 28 volumes published over a span of 38 years. Martha Finley is currently considered a "single author." If one or more works are by a distinct, homonymous authors, go ahead and split the author. Martha Finley is composed of 16 names. You can examine and separate out names.